This month, we had the pleasure of speaking with our latest Gold Coin recipient, Grocery Manager, Rusty Spencer from Orlando, Florida. Perhaps this is your first time hearing about the Gold Coin award. If that’s the case, you can find more information here. 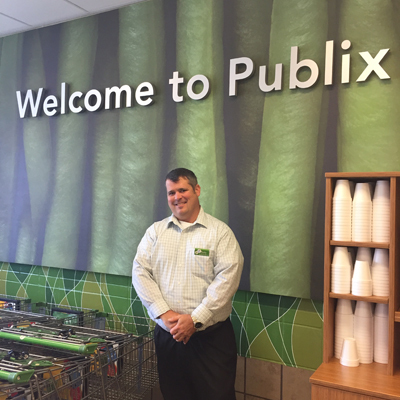 Though he joined Publix in 1988, the grocery business is in his DNA; his great-great-grandfather owned a grocery store in Oviedo, Florida. 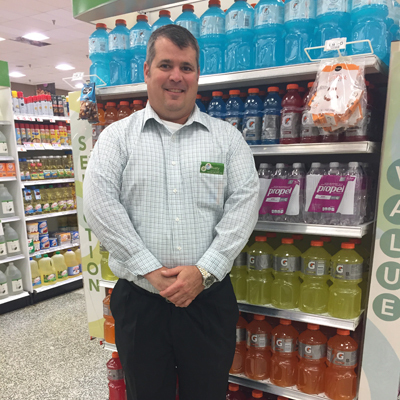 Rusty feels most accomplished by training and developing new associates to make Publix a better place to work. Coworkers describe him as a team player with a very strong work ethic who’s willing to lend a helping hand any opportunity he gets. It was a Wednesday evening and Rusty was the store’s closing manager, busy with the weekly ad change beginning the next day. On his way to the back room to retrieve products for a display, a customer, Jessica, approached him with a question. Jessica asked Rusty if Publix would be able to donate anything toward a dinner she was holding at a local shelter for foster children. With requests like this, Rusty usually recommends our customers to visit the Donations page on the Publix website, but when he learned that Jessica’s dinner was that evening, he told her to meet him at the front of the store when she finished her shopping. Twenty minutes later, she made her way to the front. Busy helping a coworker with a display, Rusty noticed Jessica checking out and made his way over to her. Without hesitation, he opened his wallet, took out his own card and paid for all of Jessica’s groceries for the “Foster Daughters” dinner that evening. She was in shock. When she first shared the story with us she said, “I can’t believe the love and compassion he showed for our local girls. Thank you for hiring such a wonderful community role model.” We couldn’t have said it any better ourselves. Rusty says it was a very humbling experience to receive the Mr. George Gold Coin. He was caught off-guard, but very honored and proud to receive the award. There have been numerous milestones in his 30-year career with Publix, and he is proud to have earned the Gold Coin. We couldn’t be more proud, either. Each month, we take pride in providing our readers with stories about our associates. These stories are part of our Mr. George Gold Coin program. The Gold Coin honors associates who embrace the Publix culture and provide premier customer service, just like Mr. George did.